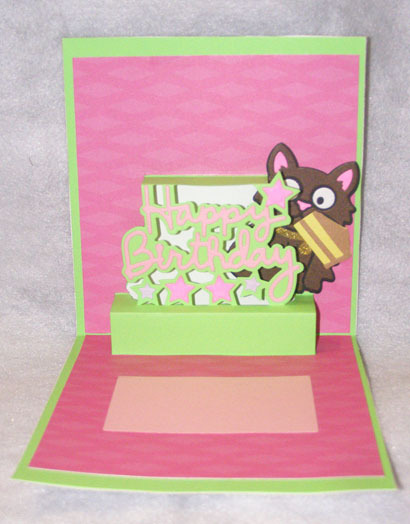 Size when closed is 4" by 5 1/2". 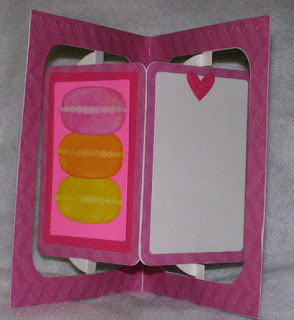 Description: Accordion Rectangle Card with a stack of 3 macaroons in Valentine colors. 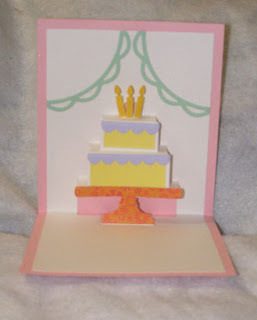 Yellow Cake with Pink Frosting Card. Size when closed is 5" by 5 1/2". 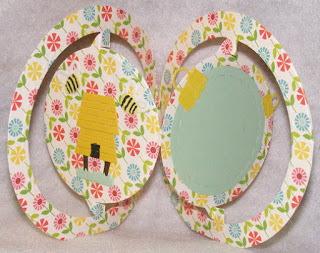 Size when closed is 4 3/4" diameter. 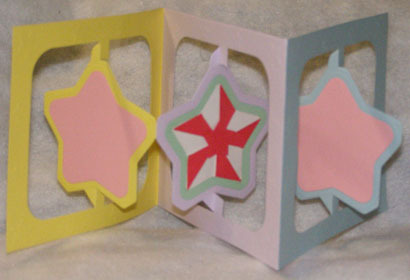 Description: Star Accordion card with a two toned 3d star on the middle page. Hot Air Balloon Pop Up Card. 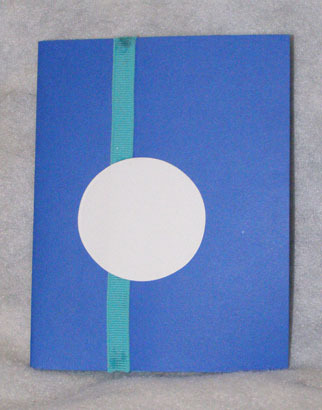 Size when closed is 4 1/4" by 5 1/2". 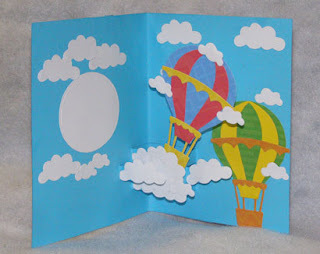 Description: This card has a two hot air balloon with a lot of clouds. 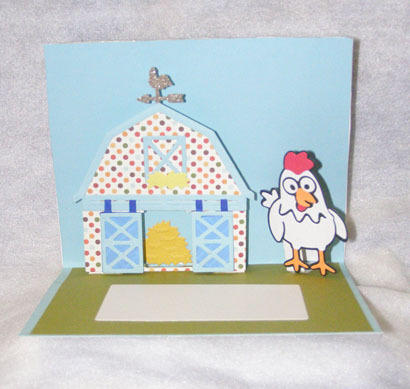 Barn with Chicken Pop Up Card. 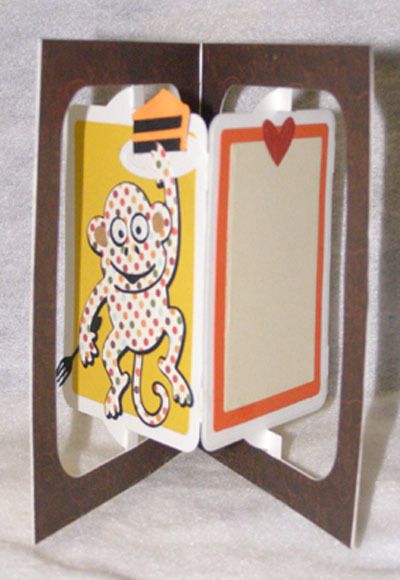 Size when closed is 5 1/2" by 4 1/2". Description:The front of the card has polka dot embossed on silver shimmer sheetz. 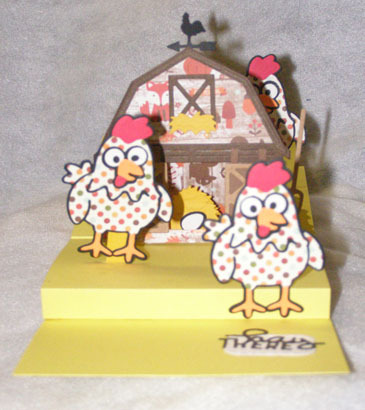 Inside of the card has a polka dot barn with a chicken. Description: Fall Barnyard Card with a three polka dot chickens with a fall barn and haystacks. Size when closed is 4 1/2" by 5 1/2". Description: This card when it opens it spins two gold glitter hearts up. 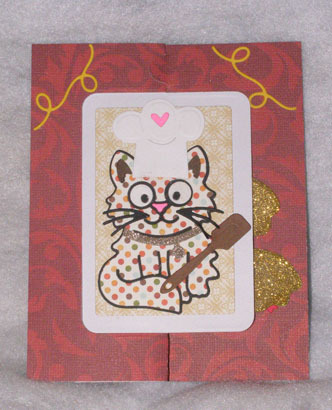 The front of the card has a chef polka dot kitty holding a spatula. 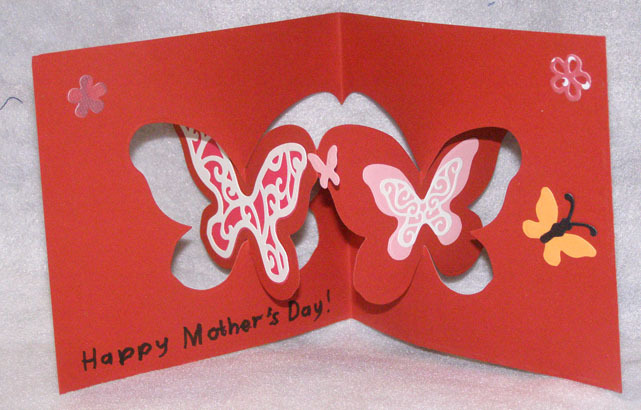 Envelope is included. 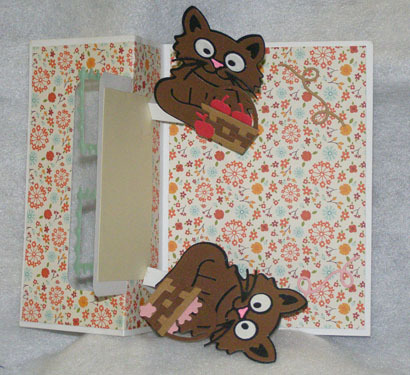 Kitties with Baskets Rectangle Pull Card. Description: This card when you open it the kitties holding baskets spin with one facing up and the other facing down. 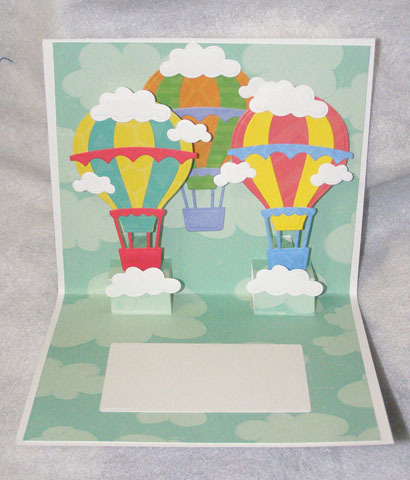 Envelope is included. 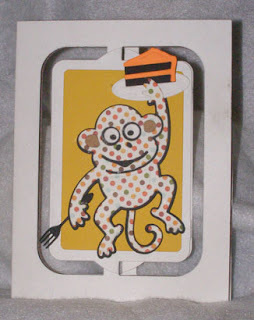 Description: Accordion Rectangle Card with a polka dot monkey holding a plate with a piece of chocolate cake and a fork. 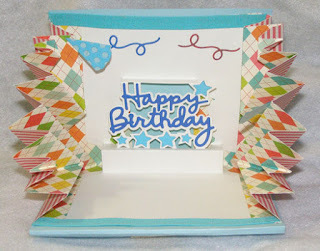 Envelope is included. 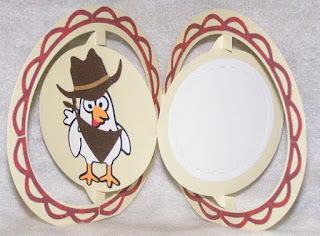 Size when closed is 4 5/8" diameter. 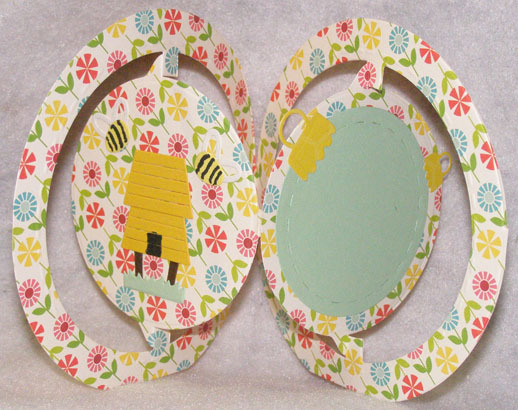 Description: Two honeybees and hive on a pretty flowering ring accordion card. 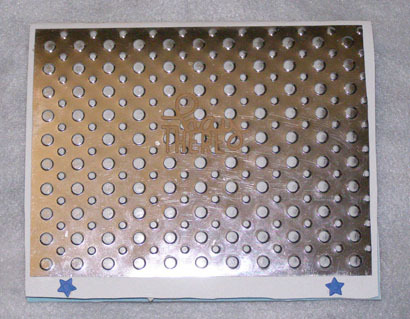 Size when closed is 5 3/4" by 5 1/8". 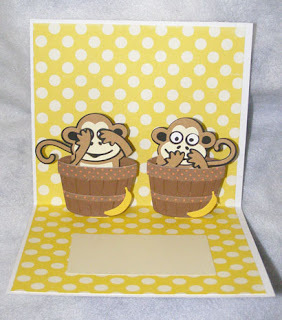 Description: Two cute monkeys each in there own barrel basket on yellow polka dot patterned paper. One of the monkeys is covering his eyes and the other one has his arms over his mouth. Description: Two beautiful hot air balloons on Pop up with a another gorgeous hot air balloon behind on the cloud pattern paper. 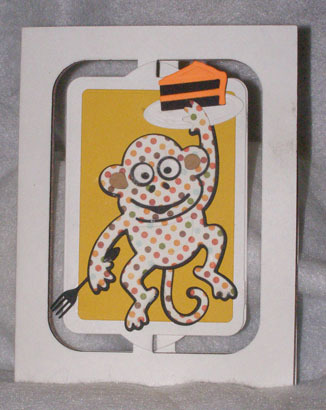 Size when closed is 6" by 5". Description: This bulky pretty card is wonderful with the patterned paper explosion sides with the Happy Birthday Pop up between the beautiful sides. Description: A chicken wearing a cowboy hat and a bandanna on a western ring accordion card. 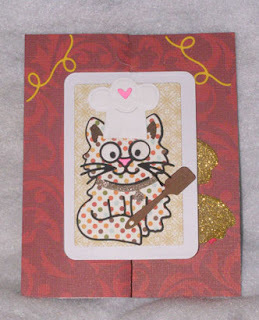 Size when closed is 5" by 51/2". Description: This card has a pretty cat eating a piece of cake peeking from behind the Happy Birthday Pop Up. Size when closed is 5" by 5". Inside of the card: Looking from the front. Inside of the card: Looking from the side. Description: Awesome Barnyard Card with a three chickens with a barn and haystacks. 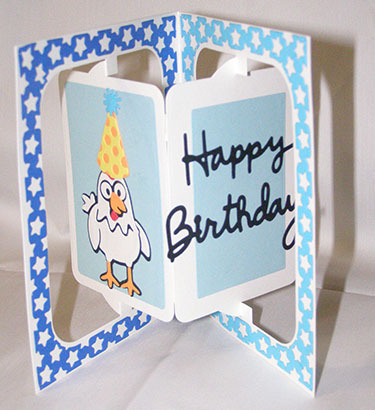 Description: Accordion Rectangle Card with a chicken wearing a party hat and saying happy birthday. 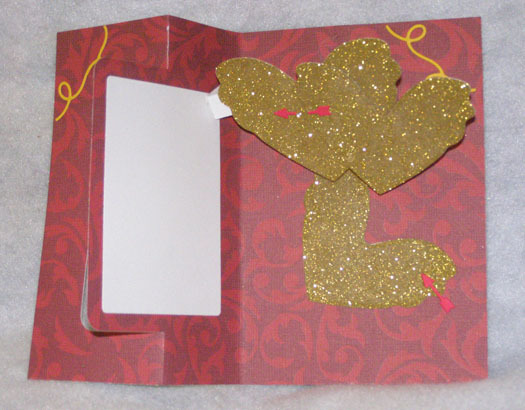 Envelope is included. Book Review on the Love on the Range by Jessica Nelson. I found this book very exciting and enjoyed the romance and mysteries feel of this historical book. This is the author's first book to come out and I will defiantly read more of her books. 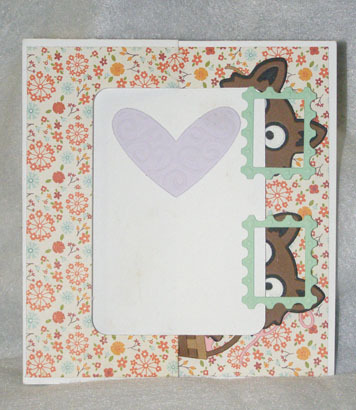 Knitted and Crocheted Pattern Sites. 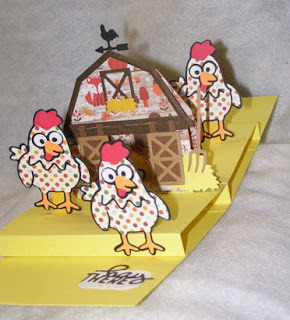 Here is some sites where I have bought knitted and crocheted patterns: (the first two sites in the list are doily pattern sites but the other ones are dishcloth pattern sites).